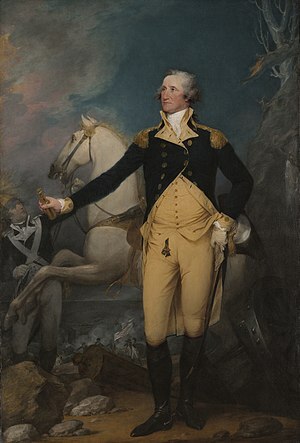 “General George Washington at Trenton,” by John Trumbull. Courtesy of the Yale University Art Gallery, Yale University, New Haven, Conn. Gift of the Society of Cincinnati in Connecticut. The founding of the United States was intertwined with common sense ideologies and the religious faith of our founding fathers (manuscripts chronicle this in detail here, here, here, and here). The religious ideas transcended upon the essence of the nation and were intertwined with the founders at the center point of their lives (Cf. Founding Faith: Providence, Politics, and the Birth of Religious Freedom in America). This was no different for George Washington as his faith from childhood, presidency, and death. No founding father’s faith has been the source of debate among scholars during the twentieth and twenty-first centuries. The debate has particularly centered around scholars questioning if his faith was a matter of being a modern secular believer. This ideology was regularly referenced as being a deist, which is defined as “an individual who is non-religious and who simply believes in a highly removed and impersonal God” by The Oxford English Dictionary. Or if he was even an authentic Christian (The first book to discuss this topic for general readers is Washington’s God: Religion, Liberty, and the Father of Our Country by Michael Novak and Jana Novak). It was not until around the bicentennial of Washington’s birth, in 1932, that the consensus view about his Christianity began to shift towards the view that he was a deist. The story behind the question of George Washington’s faith is rather straightforward. Washington was a leader who was known for expressing his beliefs throughout his military and political career (The Papers of George Washington illustrates him talking of faith in his personal life and public lives). The religion of George Washington has been of high interest to the public. Although, the same interest has been used negatively as “there has been a lot of controversies about the subjects, much of it quite passionate.” (Michael Novak and Jana Novak, Washington’s God, xi) One of the center points surrounding the controversy was the untrustworthy story about Washington’s prayer at Valley Forge, including speculation that he had left hand written copies of his daily prayers during that week. However, the twentieth-century historian has been uninterested in the questions about Washington’s faith. Therefore, you simply see them side stepping the underlying issues by labeling him “as a deist, at best a tepid Anglican, and little more than a practical eighteenth-century rationalist,” (Ibid) to fit their underlying rationale. Historians that support this ideology routinely base their assumptions on three distinct arguments. First, that Washington is a Deist, which assumes that his use of so many names for God was a result of Washington using Christianity as a tool to bind a nation together. Thus, equating the use of religion as the matter of convenience. (Cf. George Washington’s Sacred Fire, 560 – 562 to see the various names that Washington used to refer to God). Secondly, it is argued that he kept up the appearance of being a Christian man, in a tepid fashion, to suit the public need for a religious leader, not out of conviction. In short, it is argued that he was not a Christian, or barely so. Third, even though Washington often spoke of “providence” he was referring to realm something like fate or destiny rather than the Hebrew and Christian God (examples found here,page xi; here, pages 25 – 60; here; and here) – including communication to leaders under his authority, both during his military and political careers. Thus, the argument is centered around the idea that Washington was a Christian in “secular,” which is defined as “Living ‘in the world’ and not in monastic seclusion, as distinguished from ‘regular’ and ‘religious'” according to The Oxford English Dictionary, terms than an authentic Christian. However, twenty-first century historians have revisited the question about Washington’s faith in an honest and sincere approach to find that Washington was an authentic Christian (Cf. Washington’s God; George Washington’s Sacred Fire; and George Washington: American Moses). In order to present the stances in the scholarly controversy over Washington’s faith, this historiographical essay will take a thematically approach to analyzing the scholarship on his faith. Furthermore, it shall contend that Washington was a Christian, and not merely pretending to be a Christian, manipulating Christian actions, or words for political ends. Many circumstances suggested that being the case. He referred to God more often and in too many ways to make it unrealistic for him not to believe truly in God (Cf. George Washington’s Sacred Fire, 560 – 562). In addition, it is unbelievable that a person who did not have such faith would undergo such difficulties to attend church so consistently. in trying to revise the historical fact of Washington’s faith, was an attempt to fit the image the modern historian envisioned. The amount of primary sources available for this topic is rather vast, which exposes the religious focus of Washington’s life, particularly how his faith factored into his daily living: The Rules of Civility and Decent Behavior in Company and Conversion. He was a man who had an immense religious knowledge (George Washington’s Sacred Fire: Appendix 8, 835 – 844. Also, Appendix 9, 845 – 906), which he often expressed through sermons in appropriate settings(George Washington’s Sacred Fire: Appendix 5, 815 – 830. Also, Appendix 2, 739 – 760). The success that Washington had militarily and politically gave him the opportunity to express his ideas of how the nation should act. Washington was granted the ability to express his religious concerns and expectations because of the support he garnered was illustrated by many people that showed their support publicly and privately (George Washington’s Sacred Fire: Appendix 6, 831 – 834. Also, Appendix 7, 835 – 844. In addition, Appendix 10, 919 – 958). The scholarly attitude towards George Washington’s faith was altered in 1963 when the book George Washington and Religion was published. The author, Professor Paul Boller, opened chapter 5, “Washington’s Religious Opinions,” with the statement: “[b]roadly speaking, of course, Washington can be classified as a Deist” (Kyle Boller, George Washington and Religion, 94). Boller’s thesis has been widely accepted by scholars and has been developed further by scholars. Given this, In the article “Why Have Scholars Underplayed George Washington’s Faith?”,Peter A. Lillback, stated that recent scholarly works on his faith, described him as: “‘A lukewarm Episcopalian’, ‘a warm Deist’, ‘not a deeply religious man’, ‘not particularly ardent in his faith’, ‘one who avoided’, ‘as was the Deist custom’, ‘the word God’.” But, if the scholarly works evaluations are accurate, then it is appropriate for them to minimize the role of faith in his life. It is unknown why numerous scholars have trustingly accepted the view Boller has written. It is difficult to place reasons behind scholar’s actions, but the adage that the living can construct the history of the deceased to say what they consider proper (Peter A. Lillback, “Why Have Scholars Underplayed George Washington’s Faith?”) appears to be the underlying occurrence in the scholarship following Boller. In all aspects of George Washington’s life, his uniqueness shined through. In addition, the historical social setting of Washington makes the task of discovering his personal faith a challenge. This is a side effect of him being such a private man, who prided himself on being a man who adhered to non-self-disclosure. His public life highlighted him as a man who tirelessly worked to unite a diverse group of soldiers, who made up the nations first military, and the federal government – considering the fact that there was no precedent for the first president of the United States. As a result, Washington’s influence is clear as he united and shaped a nation through his actions, which become presidential traditions. He sought to unify by seeking the common denominator, which was the common desire to overthrow British control over their lives. This resulted in his personal religious beliefs and concerns becoming subordinated in his public life. Furthermore, in a historical context, a Virginian Gentlemen was not required to be explicitly expressive as a man who was not a theologian. Although the Great Awakening was influential among-st the colonies, it had not influenced Virginia as much as the others. In addition, Washington “outreached” to his fellow Americans through his personal example, his leadership, and contributions. The perspectives of recent historians moreover accounts for the underdevelopment of the important role faith played in George Washington’s life. The veracity of his life has been caught in between the American cultural wars. In “Why Have Scholars Underplayed George Washington’s Faith?,” Peter A Lillback argued that “[i]f the recent zeitgeist has been a conscious move toward secularism in the academy and in the courts, then it stands to reason that Washington would begin to take on a more compatible secular image in the hands of such authors who so significantly shape our American culture.” The severance of Washington and religion is necessary if society’s fundamental idea of separation of church and state is to flourish. In order to do so, the image of such a prestige’s figure, in U.S. history, must be changed to this view. Therefore, despite his genuine faith and the sources that prove such, the scholarship on Washington’s christianity has been revised to fit the current system of belief. Additionally, no matter their view, historians agree that the “greatness” of Washington made him except-able to hagiography and exaggeration. There are many myths of George Washington that have had to be resolved through critical historiography to show the man behind those myths. Although some of the evidence on Washington’s faith is legitimately in the realm of unsupportable myth, the assumption that all is hagiographical resulted in the temptation to dismiss all evidence about Washington’s faith (Peter A. Lillback, “Why Have Scholars Underplayed George Washington’s Faith?”). Previous generations felt it unnecessary to establish a scholarly case as his faith was self-evident. Therefore, when faith was first examined, it was unable to withstand the examination. The inability for evidence to withstand an examination does not indicate that there is no evidence to support the faith of Washington, but rather, that the case had to be rebuilt upon the foundation of original sources and historically correct arguments. This is the stalemate that history has been regarding the faith of Washington. Therefore, the addition of an in depth analysis of the applicable evidence has been necessary. This gap in historiography, has been filled by Peter A. Lillback’s book, George Washington’s Sacred Fire. It has overtaken the dominance of Boller’s work and others, who had fallen into the trap of relying on secondary sources. On the other hand, George Washington’s Sacred Fire is founded upon the context of Washington’s own words, along with his actions, to prove the veracity of his authentic faith. The University of Virginia and the Library of Congress have made it possible for individuals to access sources digitally. Also, The Paper’s of George Washington’s have only been published or available online for a short period, which has made them available to recent scholarly research. These letters give vital information about Washington’s faith as they bring insight into the thoughts, which express his faith and religious concerns. Due to the limited access, washington’s library is difficult to access. However, the personal collections of sermons and correspondence to clergyman provide a great source to understand his religious thinking. Despite the limited access, historians are now able to uncover what was formerly unavailable to previous scholarly works. The availability of Washington’s personal correspondence sheds a new light onto his faith as his own words present a new perspective that modern historians could not before. He composed over one hundred prayers that show him describing himself as a man of deep faith. For example, Washington stated that “[n]o man has a more perfect reliance on the alwise [sic] and powerful dispensations of the Supreme Being than I have nor thinks his aid more necessary” (Washington’s God, 61). In conclusion, this historiographical essay has taken a thematic approach to analyze the scholarship on George Washington’s faith, to contend that he was an authentic Christian, and not merely pretending to be a Christian, or “Deist” that manipulated christian actions or words for political means. The uniqueness of Washington was the result of society seeing him as a hagiography figure, which resulted in him becoming a giant of a figure. The lack of original sources, before the addition of The Paper’s of George Washington enabled scholarly attitudes to be developed, that had not been fully developed on all the proper sources before there availability. Michael Novak and Peter Lillback are recent historians who are attempting to clarify the public image of George Washington, which had been altered, according to them, based on historians perspectives published prior to their own works on Washington’s faith. However, the development of new and easier access to evidence has created a new angle to add the debate of Washington’s faith. These new sources have allowed historians seeking to find the meaning of religion in George Washington’s personal life through analyzing areas, such as George Washington usage of words, which saw a vision of Christian beliefs as a nation’s core. These sources have illustrated that he never used the word “Deist” or any other references that could imply that term, in his writings. However, he routinely referred to religion, Christianity, and the Gospel. Washington placed God at the center point of his life as he spoke of Jesus as “the Divine Author of our blessed religion” (Washington’s God, 203). The highest priorities of one’s life will always shine through the speech of one’s heart, showing to us all what was the dearest to George Washington. The faith of George Washington in the Christian God was so great that he encouraged seekers to learn “the religion of Jesus Christ” (Ibid., 137). The person that is committed and faithful to his or her religion seeks to encourage other to seek the doctrines center point. Therefore, his sincere faith in God engulfed his concern for his military and the populace of the U.S. He stated to his soldiers, “To the distinguished Character of Patriot, it should be our highest Glory to add the more distinguished Character of Christian” (Ibid., 90). In addition, Washington declared in his Thanksgiving Proclamation that, “…it is the duty of all nations to acknowledge the providence of Almighty God, to obey his will, to be grateful for his benefits, and humbly to implore his protection and favor.” In short, he had an extreme desire to see other American’s stay focused on God, and believed this focus would allow the United States to thrive as a young nation.